People-including government officials, European Union (EU) representatives and some think tanks say that Ghana has no choice other than sign the regional Economic Partnership Agreement (ECOWAS EPA) because it is a requirement of the World Trade Organisation (WTO) rules. Judging from what is actually contained in the EPA text, this statement is misleading. The ECOWAS negotiators have failed to properly interpret the relevant WTO rules and have tended to accept EU’s interpretation of the rules which favours its interest. As a result majority of the subjects within the ECOWAS EPA have nothing to do with WTO rules. Even the few items that are covered by the WTO rules, there are many options that could have been applied than what is in the ECOWAS text. The ECOWAS text covers issues relating to the conditions under which import and export of goods can take place between West African countries and the EU (goods EPA). This is the part of the negotiations which have been concluded so far. But in addition, the ECOWAS-EPA text contains what is known as a rendezvous clause, a commitment that within six (6) months after concluding the agreement regarding imports and exports, the parties adopt a firm agenda for liberalisation of the other sectors of the West Africa economies. All the issues from (ii) to (vii) are not required by WTO rules. In order words there is no WTO rule that requires that in order to continue to export our goods to the EU market and they to our market, we must have those issues. In fact on most of the issues, there exists no WTO rule currently. Of these only (a) and (b), as listed above, are directly covered by WTO rules. The rest are not required by any WTO rule. For instance there is no WTO rule that requires the inclusion of export taxes which prevents West Africa countries from introducing new taxes or increasing the level without getting permission from the EU. This will seriously constrain the ability of governments to use export taxes to encourage value addition by domestic firms. Ghana has an export tax on scrap metal with the rational to making the product available for use by domestic firms in the manufacturing sector. The UK, for instance, like most developed countries, imposed exports taxes on raw wool and hides for its industrial development. Again, there is no WTO rule that requires the ECOWAS EPA to include the Most Favoured Nation (MFN) clause. The EU-Mexico free trade agreement does not have an MFN clause. The inclusion of MFN clause implies that EU automatically qualifies for any more favourable treatment that the region offers to a third party (outside the Africa, Caribbean and Pacific countries) in its future trade agreements. This gives the EU a competitive edge in its quest for raw materials and markets across Africa to the detriment of West Africa own development. Even on the degree of market access opening, which is required by WTO, there is no rule which dictates that this must be 60 or 80%. All the rule says is that substantially all trade between the parties must be covered. This is not defined by the rule itself or other jurisprudence. Some have defined substantially all trade to mean: more than some trade, and less than all trade. In the EU own experience, there have been instances where countries have opened less than 80% to the EU. In 2001, the EU entered into a free trade agreement with Mexico, which is an OECD country, with a per capita income of over $6000.00 as compared to lower per capita income countries of West Africa. Mexico was required to liberalise only 54.1% of imports. So West Africa was right to demand only 65% liberalisation. 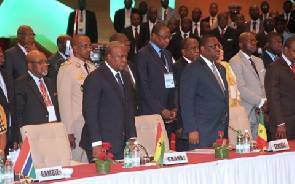 Only the actions of Ghana and Cote d’Ivoire undermined the West African position. So from the above it is clear that the WTO rules are not interpreted correctly. So those who describe people, who disagree with government officials and other think tanks on the EPAs, as emotional and ideological, do not understand the rules of the WTO and want to sign away the rights of Ghanaians. a. Sylvester Bagooro, Third World Network-Africa, Box AN 19452, Accra. Tel: +233 269 613132. Email: politicaleconomy@twnafrica.org. American Dollars a year. At least a million in the USA alone.